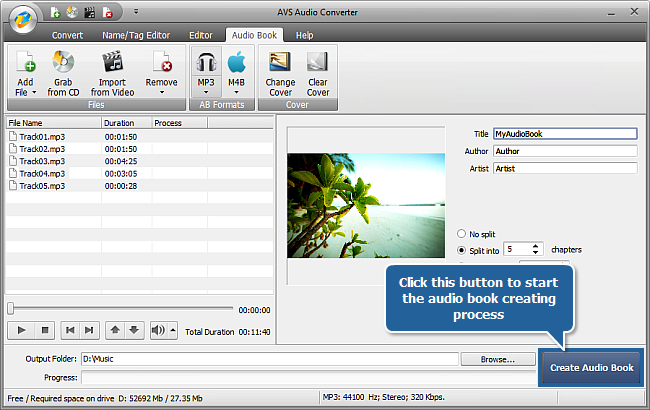 How to create audio books using AVS Audio Converter? There are many reasons why audio books are very popular these days. For example, if you don't have time to read, then you can listen to audio books uploaded to a portable player even while doing something else. Audio books in mp3 format are commonly used and can be listened to on almost every portable device. Let us suppose that you have recorded yourself reading and want to make your own audio book out of this voice recording. 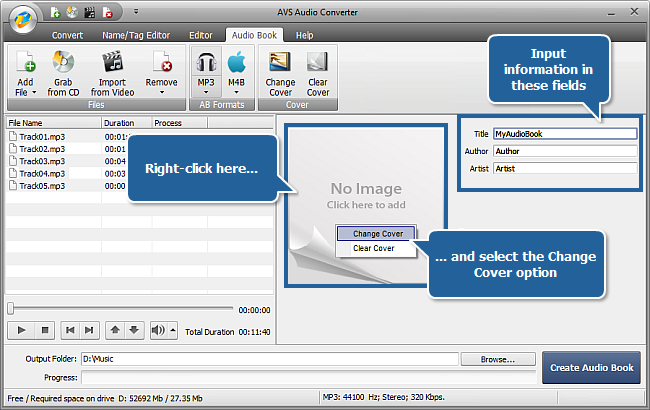 AVS Audio Converter will help you perform this task. Click here to download it. After the download is finished, run the AVSAudioConverter.exe file and follow the installation wizard instructions. 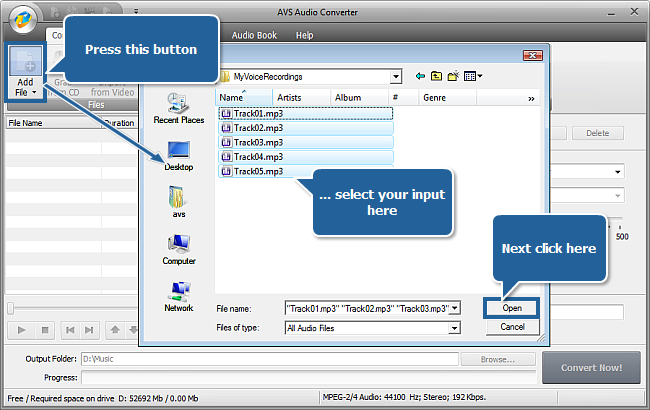 Double click the AVS Audio Converter desktop icon or follow Start>> All Programs>> AVS4YOU>> Audio>> AVS Audio Converter to launch AVS Audio Converter on your PC. To load one or a number of audio files into the program click the Add File button. In the opened Windows Explorer window select the necessary files and press the Open button. Note: you can also load your input files from your personal CD or import an audio track from video. You can process your input audio prior to creating an audio book if you need to delete some unnecessary parts or want to apply the Normalize effect for example. Switch to the Editor tab, then double click the file you want to edit. It will be visualized in the edit area on the right. 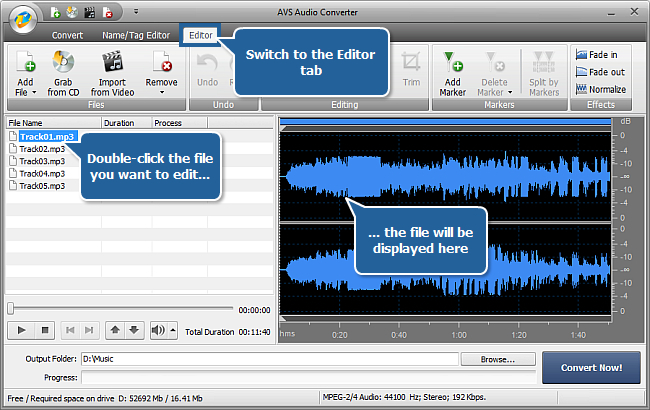 Refer to the Editing Audio chapter of our online help to learn more on editing options in AVS Audio Converter. First of all switch to the Audio Book tab. If you have loaded several audio files, set the needed track sequence by clicking the file whose position you'd like to change and then pressing the Move up or Move down button below the conversion list. 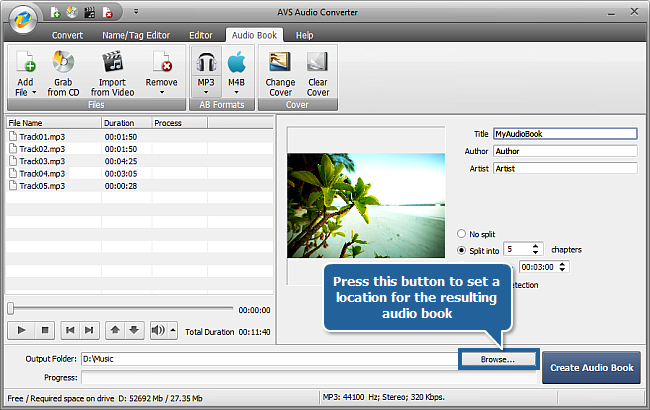 Press the MP3 button of the AB Formats group on the command bar in order to set the output format of your audio book. 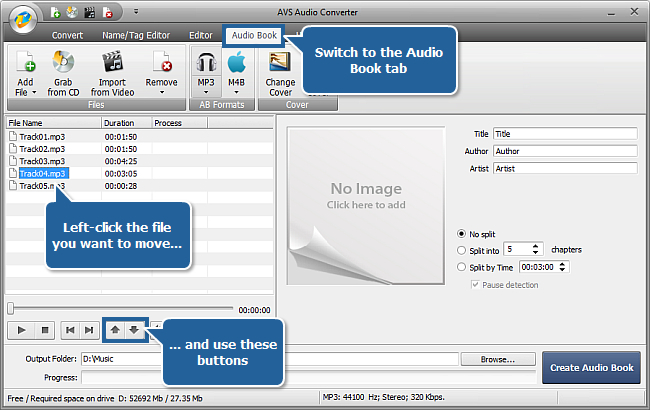 Note: in this guide we suggest that you use mp3 format but AVS Audio Converter also lets you create audio books in m4b format. Split by Time – if you want your audio to be split into equal parts of a specified duration. Use the arrows or the keyboard to input the needed value. If you select splitting by time or by the number of chapters, then the Pause detection option will be available. If it is checked your audio material will be split into the selected parts according to the moments of silence detected. Then fill in the fields with the information about the Title of your forthcoming audio book, its Author and Artist reading the text. To load an image for your audio book cover right-click the Image Area and select the Change Cover option from the menu. In the opened Windows Explorer window select the needed picture and press the Open button. To delete or replace the cover use the right-click menu options or the corresponding buttons of the Cover group on the command bar. Click the Browse... button next to the Output Folder field and set a location on your computer HDD. Press the Create Audio Book button situated in the right bottom corner of the program window to start creating your audio book. You will see the overall progress on the progress bar in the output audio area. In the output folder you will find a subfolder that contains an mp3 file (or several files depending on your choice of file splitting) and an m3u playlist which allows you to navigate through chapters during the playback on a player. Now you can leave your created audio book on your computer HDD or upload it to your portable player and enjoy listening to it.